A couple of decades before the Pebble Watch, the Samsung Gear, the Sony Smartwatch, the i’m Watch, the Moto 360 or the LG G Watch were a couple of other time pieces worn on the wrist and produced by two Silicon Valley natives. In 1995, Apple had its own branded watch to help with a marketing campaign for its new operating system. And 20 years before that, Intel had the Microma digital watch. 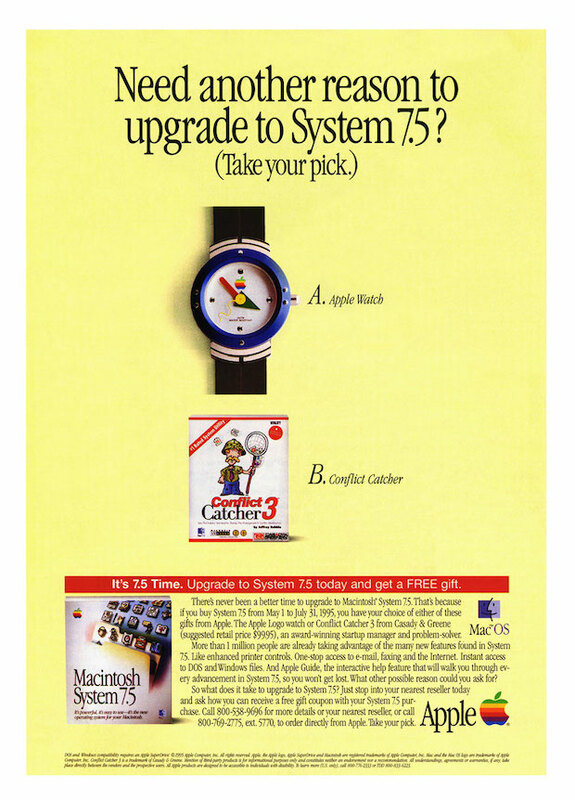 In 1995, Apple aimed to lure consumers to upgrade their Macs to System 7.5, then the latest operating system, by offering either a free version of Casady & Greene’s Conflict Catcher, a program designed to help eliminate start-up issues or conflicts between application extensions, or an Apple Logo Watch. The Conflict Catcher software had an estimated value of $99.95 at the time. It can be assumed that the Apple Watch had a similar street value. Recently, these vintage Apple watches have sold on eBay for over $120. Microma watches were the first with an LCD display. From the Intel Museum. Believe it or not, Intel had the idea for a smarter watch more than four decades ago. In 1972, Intel acquired digital watchmaker Microma, which had developed liquid-crystal displays (LCDs) for use in products such as digital watches. The quartz crystal oscillator was used as a time base, proving to be more accurate than traditional mechanical watches. The integrated circuit found within the Microma watch was considered to be one of the first examples of a system-on-a-chip (SoC), an Intel 5810 CMOS, as it contained all of the electronic components including analog and interface circuitry. In 1978, Intel sold the Microma name to a Swiss company and the watch designs to Timex. 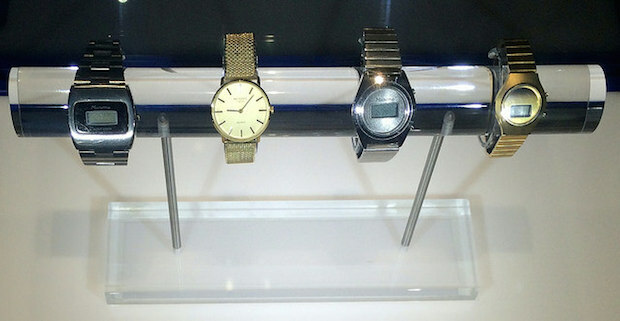 Intel co-founder Gordon Moore said the company released the first watch with an LCD and hoped to do more. Intel's efforts failed. The technology simply hadn't reached a point where chips were small and powerful enough to do much inside a watch other than tell time. Moore wore his watch for years afterward as a reminder to stay out of the consumer watch business. He says he called it "my $15 million watch," to remind himself how much the company lost in the endeavor. Intel, acquired wearable maker Basis earlier this year.